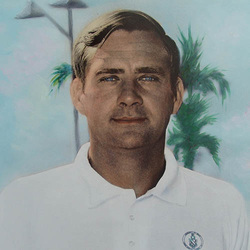 The name Tom Gompf is synonymous with the great tradition of Miami diving. During his 10-year tenure (1972-1981) as a coach at UM, he coached 28 All American, including Olympic and national champion Greg Louganis, four-time national champion Melissa Briley, along with Matt Gribble and David Wilkie. Among Gompf's many coaching achievements, he was selected as the team manager for the U.S. Olympic Team in 1976 and 1984, with the '84 squad capturing two gold, one silver and two bronze medals. Tom was the chairman of the Olympic/International Committee for U.S. Diving from 1980-84, President of U.S. Diving from 1986-90, and the Chairman of the F.I.N.A International Diving Committee in 1988. But Gompf's accolades aren't limited to his coaching days. He is also a former Olympic medalist, taking the bronze medal in 10-meter platform diving at the 1964 Olympic Games in Tokyo. He was the national A.A.U. champion in platform diving in 1963 and 1964, as well as a 1961 national champion in trampoline and diving. In all, Gompf received nine All American selections in his collegiate career at Ohio State. He capped his brilliant career by claiming the World Professional High Diving championship in 1970 and 1971. Gompf served as a sports advisor for diving for the Atlanta Olympic Committee, and was head of the Technical Commission for the diving events for the 1996 Olympics. In 1980 Gompf was a founding member of USA Diving. He later promoted synchronized diving and is considered the father of those events. Gompf was elected into the International Swimming Hall of Fame in 2002. In 2010 the US Olympic Committee awarded him the George M. Steinbrenner III Sport Leadership Award, which honors "an outstanding member of the Olympic family."